Getty Images/Spencer PlattPolice and demonstrators clash in downtown Washington after a limo was set on fire following the inauguration of President Donald Trump on January 20, 2017 in Washington, DC. Washington and the entire world have watched the transfer of the United States presidency from Barack Obama to Donald Trump, the 45th president. A jury acquitted six defendants on Thursday over their roles in violent protests that erupted on Inauguration Day. The defendants argued that they had not participated in any violence, while prosecutors said they were guilty of destroying property and engaging in a riot because they were aware of violent intentions of others. The defendants were the first group to stand trial of the dozens of other protesters arrested the same day. 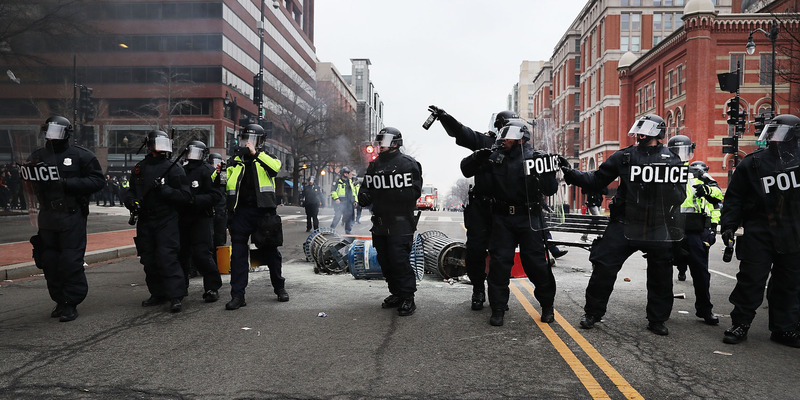 Six defendants who stood trial over their roles in an Inauguration Day protest in Washington, DC, that turned violent were cleared by a jury of all charges on Thursday. Each of the defendants had been charged with destruction of property – a felony – and engaging in a riot and conspiring to riot. The verdict came after a nearly four-week trial. The defendants – Jennifer Armento, Oliver Harris, Brittne Lawson, Michelle Macchio, Christina Simmons, and Alexei Wood – had been part of a larger group encircled by police and arrested after the protests turned destructive. Prosecutors argued that they were among the protesters that smashed windows of businesses and set a limousine on fire, causing damages that totaled $US100,000. Defence attorneys, however, argued that the defendants had not participated in or supported the violence, and the First Amendment protected their rights to participate in the protest despite the violent actions of some. 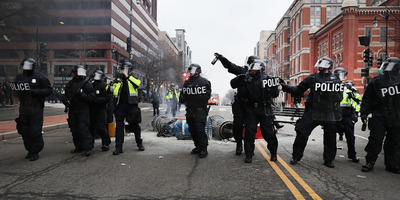 Thursday’s verdict handed down a sweeping victory to protesters and journalists and boded well for the remaining 166 people – known as “J20 protesters” who were arrested during the Inauguration Day protests on January 20 and scheduled for trials throughout 2018. Defendants on Thursday reacted with relief, smiles, and in some cases tears as the verdicts were read. “[The verdict] shows the country that the jury was unwilling to do what the government wanted them to do, which was criminalizing dissent,” Armento told The Washington Post. Wood reportedly covered his face, sat down, and sobbed as the jury foreman read the not guilty verdicts. It’s unclear whether the government will pursue the remaining cases after Thursday’s verdict, but in a statement from the US Attorney for the District of Columbia, prosecutors indicated that they’re considering it. Press freedom advocates had watched the trial closely, as Wood had attended the protest as a freelance photojournalist. Two of the women also attended as “street medics” and had brought with them medical supplies such as gauze. Prosecutors had not provided any evidence during the trial that any individual defendant was guilty of destroying property. Instead, they made the broader case that all protesters were aware of the violent intentions of other participants.